ShUM cities of Speyer, Worms and Mainz is part of the Tentative list of Germany in order to qualify for inclusion in the World Heritage List. The term ShUM is an acronym from the initial letters of the medieval names of Speyer, Worms and Mainz in Hebrew: Schin (Sh) for Schpira, Waw (U) for Warmaisa und Mem (M) for Magenza. The Jewish communities in these three cities originated in the 9th and 10th centuries and had their heyday between the 11th and 14th centuries. During this period several important scholars and teachers lived in the ShUM communities. The three cities were a centre of Jewish culture, law and learning and were highly influential in the development of Ashkenazic Judaism. Their significance declined in the mid-14th century, the inexplicable outbreak of the Black Death pandemic led to pogroms throughout Europe and the Jewish quarters in the ShUM communities were burned and widely destroyed. Jews came back a few years later, but the communities never regained their former importance. The site in Speyer is an easy catch when you visit the Cathedral, the Judenhof is just 200 metres away. The Judenhof was the centre of the medieval Jewish quarter, today you can visit the ruins of the synagogue, the ritual bath and a small museum. The synagogue dates back to the early 12th century, but only the outer walls have been preserved. The mikveh from the same period is considered the oldest of its kind in Central Europe. It has been preserved almost unchanged and has a nice Romanesque vaulting. A staircase leads through a vestibule down to the water basin ten metres below ground level. 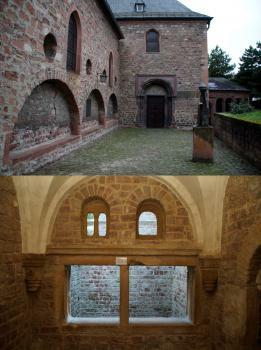 The ritual bath is worth seeing and is the most interesting part in Speyer (the lower photo shows the vestibule). Worms is one of the oldest cities in Germany, but it was heavily damaged in WWII and only little remained of the historic structure. But with regard to the Jewish heritage Worms is probably the most interesting of the three cities. The former Jewish quarter was located in the northeast of the old town along the medieval city walls, parts of the wall are still standing. The medieval layout of the quarter is still visible, eg in the Judengasse, although most of the houses were newly built during the following centuries. The first synagogue in Worms was built in the 11th century, but it was destroyed and rebuilt several times. Like most other Jewish buildings, synagogues and stores in Germany, the synagogue in Worms was completely destroyed in the Novemberpogrom 1938. Reconstructed to its original plan after WWII (in part with the original material), it was reconsecrated in 1961 (the upper photo shows the entrance). Next to the synagogue is the ritual bath, it is very similar to the one in Speyer. The second site in Worms is the cemetery Heiliger Sand. It is considered the oldest Jewish cemetery in Europe. In total there are more than 2000 graves, the oldest legible gravestone dates back to 1059, the most recent graves are from the early 20th century. Surprisingly, the cemetery survived the ravages of the Nazis largely unscathed. A number of important scholars are buried in Worms, their gravestones are covered all over with small slips of paper and stones, a sign of special reverence. I used to live near Worms and I visited the Jewish sites several times. I like in particular the oldest part of the cemetery, it has a special atmosphere. In Mainz, only the Judensand cemetery is part of the nomination. It is located at the site of the medieval cemetery, but was laid out as a memorial cemetery in 1926, which means the recovered medieval gravestones have been re-erected, but not at their original location. Unfortunately, the cemetery can be visited by prior appointment only. Thus, it is not worthwhile to go to Mainz only because of the T-list site. Other remarkable sights in Mainz are the modern New Synagogue from 2010 and the stained-glass windows by Marc Chagall in St Stephan Church. There are three sites of Jewish heritage on the German Tentative List, the ShUM cities seem to have the best chances for an inscription. The remains in Worms, Speyer and Mainz date back to the Middle Ages and are among the oldest remains of Jewish culture and religion in Central Europe. The WHS with Jewish sites, such as Prague, Krakow and Trebic are from later centuries. Moreover, the ShUM communities have historical significance, they were important for the development of Judaism in Europe.